From trailer to trail with just a few snaps! We were happy to hear from Sarah and her horse Paige, who recently reviewed our quick change halter bridle. The traditional halter bridle allows you to swap between halter and bridle with just a couple snaps. Our traditional halter bridle is great for trail riders because it helps them go from trailer to trail, but Sarah and Paige reminded us its versatility is also great during the trail ride itself. I’m enjoying the halter aspect of the bridle for other reasons though. Twice now when on our trail rides we’ve had to dismount and hand walk because of the terrain. Both times I unhooked my reins from the bit and attached them to the halter lest I accidentally drag on her mouth. See the rest of Sarah’s review at her blog, A Soft Spot For Stars. We love hearing about off-track Thoroughbreds enjoying their new careers, so of course we’re proud to welcome Camile and her OTTB Gentry into our new ambassador program! Camile met Whitehouse Ridge, aka “Gentry” after exercising him for a friend and now shows the 11-year-old in hunter/jumper and dressage. Camile and Gentry recently got one of our quick change halter bridles to make it easier for them to switch from one part of their training day to the next. Q: I remember you said you exercised Gentry for a friend before buying him; what was it about him that made you decide you wanted to work with him yourself? This first time I had actually met Gentry was on a “field trip” with our 4H team. It was my first year judging and we had traveled out to my current friends place to set up a couple of classes. He was skinny, ugly looking thing that she had been giving time to recoop from his past life. At the time I had no interest in him. It wasn’t until another 2 YEARS later that I went out and visited their place again, this time helping Leeanne’s step daughter (my team captain) with grooming the ponies. The night before I had found G’s sale ad and fell in love with his movement. (I actually didn’t even know it was the same horse.) This happened to be the day that somebody was coming and looking at him for their kid and Leeanne had me work him a little after they left. Fortunately for me, they didn’t like his big movement and declined the sale offer. Later that week, I received a call from her asking if I would like to work him for her, until he sold, for a limited pay. I started working him, with my parents telling me that we weren’t buying the horse, and all of us starting falling for him. He was just so sweet, with his big brown eyes and cowlick of a mane and he always seemed to know what to do even though he was green. He was so forgiving if you messed up. Before we moved him, mom got on him and she hasn’t ridden in a while, and he took care of her by simply standing there and refusing to move. It was a funny yet kind act. That is what sold us. Q:What’s your favorite part of Gentry’s personality? He always tries his best, he gives his whole heart to me. Gentry is just that kind of guy that puts 110% ever time and it makes me so happy that I know that he will always try no matter what. Q:What are your goals for this showing season, and what types of training challenges are you working on? This year we are focusing on getting his confidence up in the show ring. I plan on showing him in 2ft h/s and eq o/f. Some of our challenges….oh my. Where to begin. You just never seem to be ready for shows. XD Headset is defiantly a struggle as well as keeping the true bend and relaxing through and over the bridle. Q:What is it about Two Horse Tack products you and Gentry love? We love the durability and quality we get out of your products. Gentry is a bit of a mud lover, so it is always nice to have the tack that will stand up to his messy habits. Q:How do you anticipate the quick change halter bridle will be helpful in your workouts? This will help us in our workouts because I go on a lot of trail rides to build his topline and this product will help us stay clean and look good J Plus, they are malleable and soft on his face. Congratulations to Gaia, winner of our recent tack giveaway with the Behind the Bit blog! We love meeting our followers on social media, and readers in the blogosphere. Gaia is a 2-year-old Tennessee Walking Horse who has been hand-raised by her human, Susan. Gaia was a dystocia foal, meaning her delivery was complicated; in Gaia’s case, her dam suffered a fractured pelvis, which meant that she couldn’t take care of Gaia. Susan tells us Gaia didn’t have to be bottle fed but actually drank milk out of a Tupperware container. Because of Gaia’s age, she’s not ready to begin working under saddle yet, but will be starting ground driving soon and her people hope to use her new bitless bridle in her early training. Susan tells us that because of the way Gaia grew up, she’s very people-oriented; sort of a “pocket pony” whose personality should help her excel at whatever she does. We’re expecting big things from this little girl! Gaia will get a great start with our two-in-one bitless bridle, which converts between a cross-under bitless bridle and a sidepull. The cross-under style works with more generalized pressure than the sidepull, which focuses pressure on the horse’s nose. Many of our customers find that the bitless bridle gives them both extra control and a better sense of connectivity with their horse. The flexibility of the two-in-one makes it a great option for those trying a bitless bridle for the first time. If you’re trying to decide between our two varieties of halter bridles, our four-legged friend Sue has a few suggestions for you. Sue was kind enough to model both our traditional halter bridle and our quick change halter bridle. Both options obviously switch between bridles and halters, but they do so differently. Here we see the bit out of Sue’s mouth with one bit hanger attached. Couldn’t be simpler! The purple and black halter bridle is our traditional variety, which has bit hangers which clip onto the cheekpieces. As Sue is showing us, it takes a couple of quick seconds to switch between turnout and trail ride. This style, as the name implies, does have a more traditional look (it comes in single-color varieties as well, in addition to bling and reflective varieties). Quick change halter bridle, which is really a three-in-one! The orange item that Sue is wearing is the quick-change style halter bridle. Just unsnap the browband and lift the headstall and bit off the horse. As you can see, you’re left with a Western headstall and a turnout halter. When the pieces fit together, you have a halter bridle. The quick change style comes in all the same color, bling, reflective, and even camo options as the traditional style. The quick change option is great for Western riders because it includes the headstall, but ultimately it comes down to which style works best for you and your horse. We can assure you that both are great, and equally maintenance-free! Just wash any of our beta pieces in soap and water to get them looking as good as new, no conditioner required. This week in our Meet Our Breeds series, we introduce you to Solitaire and Commanche, our Appaloosa models. The Appaloosa is a breed based on a coat pattern. The breed was originally developed by the Nez Perce people of the Pacific Northwest. The tribe lost most of its horses in war, threatening the breed’s future until it was revived in the 1930s. Today, the Appaloosa is the state horse of Idaho. The breed’s body type is influenced by Thoroughbred, Quarter Horse, and Arabian blood. Solid horses may be included in the registry if they can be blood typed to verify Appaloosa parentage. In addition to their unique coat colors, most Appaloosas have striped hooves, mottled skin, or white sclera around their eyes. More than 700,000 Appaloosas have been registered with the Appaloosa Horse Club since its foundation in 1938. We are lucky enough to have two Appaloosa models on our website. Solitaire is one of the many fantastic equine teachers in the Asbury University’s equine program. Asbury offers undergraduate degrees in equine science, and also has its own riding program. Commanche hails from Easy Riders Ranch in Georgetown, Ky. He is one of nine horses who provide riding lessons, riding by the hour, and rides at birthday parties. Congratulations to Ruby (aka Winteruby) and her owner Cerella, winners of our February tack giveaway! Ruby and Cerella have been working together for three years, two of which they’ve spent eventing in the beginner novice level, a great accomplishment since Ruby was very green when they started. Ruby also does hunter/jumpers and dressage (training level). She loves giving rides to kids. Cerella tells us that Ruby’s ninth birthday is coming up in March, so their prize will be a sort of early present. Ruby will be getting our beta biothane English bridle, which is a perfect fit for her and Cerella. Ruby is working to conquer her fear of water, and a beta bridle is just the thing. Beta is waterproof, so Ruby can splash all she likes without her bridle drying or cracking. Learn more about our English bridle here. Who wants a free bridle? It’s time for our February tack giveaway. 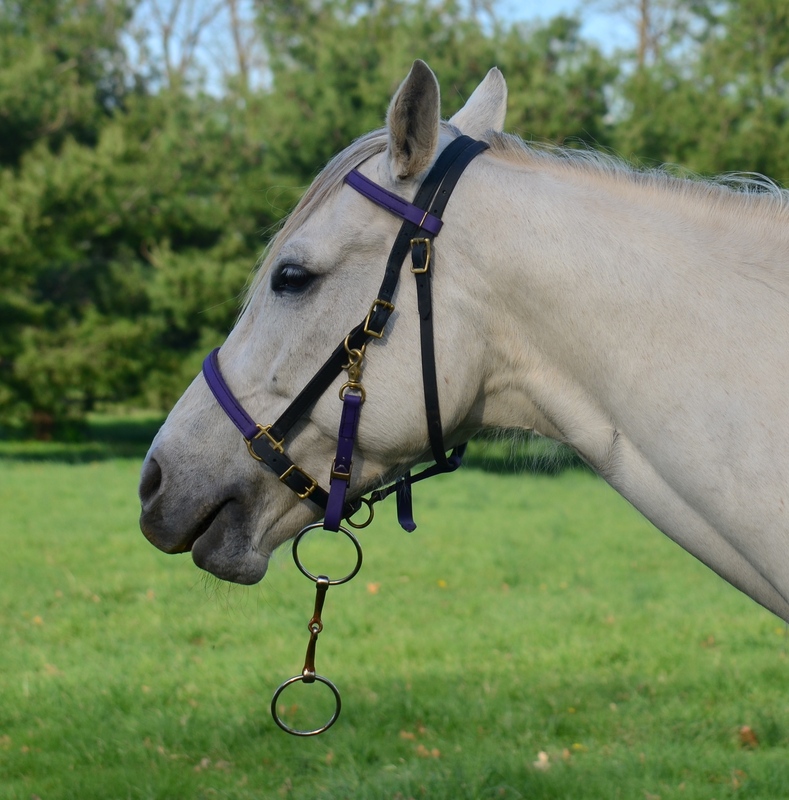 This month we’re giving away our English bridle to one lucky entrant. This bridle comes in 3/4-inch beta biothane with a one-piece removable noseband that threads through the cheekpiece. It converts easily into a Western bridle. Like all our beta pieces, our beta English bridle won’t crack, mold, or fade no matter the weather, and can be cleaned with soap and water. So, what’re you waiting for? Enter on our website today. Even if you don’t win, you’ll get a $5 coupon just for entering.